The "Russki Vityaz" formed a basis for development of the Ilia Muromets series of four-engined heavy bombers used by the Imperial Russian army during World War I. 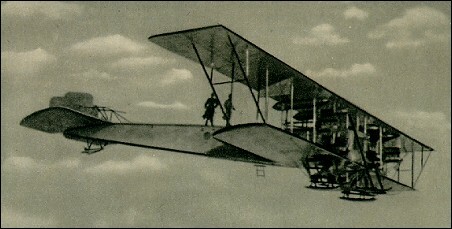 The first of between 70 and 80 of these aircraft was flown for the first time in January 1914 , and on 12 February 1914 the type established a world height-with-payload record, carrying 16 persons to an altitude of 2000m. Few of these production aircraft were identical, improvement and developing being continuous, and short engines meant they were flown with a variet y of powerplant which, in some cases, involved a mix of engines on one aircraft. Yes,this is the first strategic bomber. Unlike other nation that developed tactical bomber,russia developing strategic bomber the russian being pioneer of the heavy bomber,but this is less advance than german aircraft in that time. Fantástico, quem é rei, jamais perde a majestade. Ocassionally history lends us a genius for a time; Igor Sikorsky was one such genius. Amazing how perharps having a poor air force during WWI,Russia could have one of the most revolutionary planes of the whole war. Thanks to the eternal genious Igor Sikorsky. This was the first Strtegical bomber?